Eaton offers many different accessories that are designed to be used with the PanelMate products. 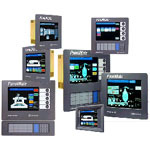 These accessories enhance the capabilities of the operator interface products and make them even easier to use. We have done the research and designed the cables needed to communicate between the OI unit and other devices. A majority of technical support questions that are answered daily by our Technical Support Team are related to communications. Don’t wonder if you designed your cable correctly, use a cable designed by Eaton. These modules easily mount to the back of the PanelMate Power Pro products. If you are using an OI with a touchscreen in a dirty environment you may want to protect your touchscreen from excess wear and tear and dirt and grease. We offer a variety of clear protective overlays that easily adhere to the display. When the overlay is used up (dirty and worn), simply remove the overlay and install a new one. Configuration Storage Module - used to store and transport PanelMate configuration data. PanelMate Pro LT 1100 I/O Reference Point Expansion - used to expand the PM 1100 standard support of 64 tags up to 512 I/O reference points in blocks of 64 I/O points.